I found this way of making the ink pen myself, but that was after searching for a long time. fav if it works and send me links to your art when you used it ! Also in the desc. there is a link to the original place where you can find the texture. hey i dont have fine_round_2 can some one help? you have to add those textures and brushes to sai yourself.. I don't either. Maybe its on a different version of sai? ummm ... can i ask if you know how to make smooth lines? Middle-right on the top. "Stabilizer". 0 being no stablizer and S-7 being extreme. I usually only use the 10 setting, but go up to S-2 when I have to make a really straight line. Linework layers are also great. The "Pen" tool in a linework layer is great - regular pen tool, but you can reposition and change the line as you wish afterwards. Is legacy pen the same thing as pen? I don't think so, haven't heard of it to be honest. Do you have a new verson of SAI? And how does the legacy pen act? Legacy pen is the binary pen. You use it to make pixel icons. I'd suggest not going over 1px in size when using it, as that would get you the thinnest line and make it look the best. I downloaded the textures for fine_round2 however I put it in and it didn't show up..did I in the wrong file? for some reason, I can find anything that says "advanced" with a check box next to too it. Here I show how how to copy ALL names of the files fast into a text list automatically. fav.me/d9nrxo0 Hope it saves you a little more time . I got BinaryPen. is that the same thing? yes I have pencil thank you! Oh, that's OK. I got it to work now anyway But thanks for the help! 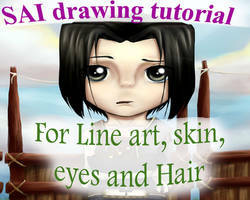 This tut was very helpful!! Aaah, this is exactly what I was looking for. Thank you so much for this! I feel like a derp for not realizing how simple it was before, ahah!